The ABCs of What Do We Do All Day? 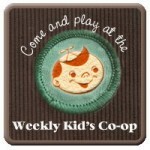 … and this week’s Kids Co-Op weekly Linky! If you are a SAHM I’m sure you’ve been asked, “What do you do all day?” Well, Erica’s (today’s ABCs feature) blog focuses on just that. Her recently updated blog (that’s looking quite amazing I must add! ), What Do We Do All Day?, answers that question with tons of posts about reading, playing games, making snacks, exploring, and learning with her kids. something you’d like to Change in your Life I’d like to have a yard! favorite Ice Cream flavor Blackberry. Mmmm. Where do you Live New York City, the Big Apple, the City that Never Sleeps! Favorite Movie(s) Oh, so hard to choose! I won’t choose a favorite, but I love a 1948 movie with Cary Grant called “Every Girl Should Be Married”. It has the worst title in the world, but Betsy Drake has this manic, infectious energy throughout the movie that makes it hard not to laugh out loud. Nickname I have no nickname! a weird thing in your Purse/bag A bag of dried mango. It’s a kid snack that doesn’t rot and smell when I forget to take it out of the bag! Time it takes to get ready 10 minutes. Getting ready is booooooring! favorite Zoo animal Otters! They always look like they are having so much fun. Due to technical difficulties the link up has been temporarily removed from this blog post. I hope to resolve the issue and get it back up soon! Sorry! Haha! I forgot I was going to be featured today! It was fun answering all those questions!